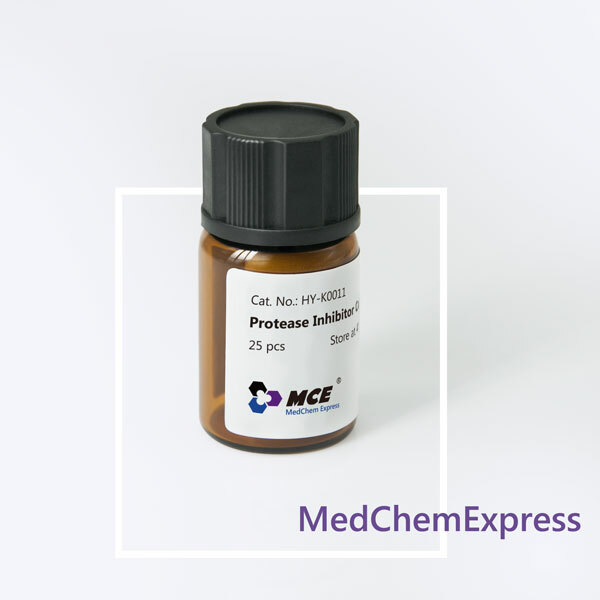 MCE Protease Inhibitor Cocktail provides Bcl-2 protection in thyroid cancer cell line 8505C, and is most effective after 6-12 hours incubation at room temperature. MCE Protease Inhibitor Cocktail (mini-Tablet) protects ERK1/2 in K1 cell line, and is most effective after 6-12 hours incubation at room temperature. Endogenous proteins are produced and removed in a balanced state, so their cellular levels are generally stable under stable environmental conditions. However, protein production is greatly halted and degradation is enhanced when cells are studied in vitro. To prevent the degradation of proteins under such conditions, one can utilize a cocktail of small molecule inhibitors to block the action of proteases. Generally, protease inhibitor cocktails are used in cell lysates or tissue extracts to increase protein stability. As the name indicates, the cocktail functions to inhibit proteases that would degrade either phosphorylated or non-phosphorylated protein substrates. 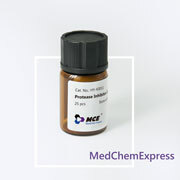 MedChemExpress Protease Inhibitor Cocktail (EDTA free, mini-Tablet) is a blend of 5 pan-protease inhibitors for protection of protein integrity. 1. This product can be applied in Western Blot analysis, Co-IP, pull-down, IF, IHC, kinase assay and etc. 2. One mini-Tablet can be added to 10mL extraction medium directly. Alternatively, a stock solution (10X conc. one mini-Tablet in 1mL ddH2O) can be prepared. Vortex briefly to accelerate the dissolution. The stock solution is stable for one week when stored at 4°C, and for at least 4 weeks at -20°C.